← Free Delivery on Jammies by Hélène Laurè through May 15th! Climb a Mountain to help fund Postpartum Progress! Join us in supporting the world's most widely read blog on postpartum depression! From Deborah Rimmler – board member of PPI about a special fundraiser taking place right now to support Postpartum Progress – the world’s most widely read and respected blog on postpartum depression! My family is going to climb in the Helderberg Mountain range – with our pups! – to participate in this great event! Get out your hiking shoes and join us! “If you are reading this blog, you are one of us. Or you love or care for people like us. We are the 15% of new or pregnant moms who have postpartum depression, anxiety, psychosis or other related mood disorders. And we have all benefited greatly from the peer support we find here on Postpartum Progress. Katherine Stone was a beacon of light during the darkest time of my life. I suffered from postpartum obsessive-compulsive disorder (the mood disorder where you get terrible, scary thoughts that won’t go away) that began after the birth of my son Henry over four years ago. I was lucky to get professional help early due to the support system I had in my life, yet I still suffered tremendously. Not even the best psychiatrist in the world can help you heal totally from the horror of having had awful thoughts that sometimes involve images of hurting your own child. One night in despair I stumbled upon Postpartum Progress. Finding Katherine and this amazing community of postpartum mood and anxiety disorder survivors helped me find peace. I felt for the first time since my son was born (and not just from my therapist telling me) that I was not alone on my occasional forays to the dark side of this disease; in fact, I’m in the company of some pretty amazing women! I’m now 4 and ½ years out from Henry’s birth and those terrifying intrusive thoughts are a distant memory. Yet I still relish the Mother’s Day Rally—each new author’s story and advice continues to comfort and reassure me that I suffer from a common disease that is treatable. I even had a second baby! I’m also now on the Board of Directors of Postpartum Progress, Inc., the non-profit organization we created to help sustain the blog and to help people understand the massive size of the problem of perinatal mood and anxiety disorders. This blog is now averaging 100,000 views a month and growing from women who are seeking help and support from all over the world. We need to do an upgrade and redesign of the blog, and we have recruited a team of volunteers called the Warrior Mom Leadership Team to help manage the ongoing content (which we’ll tell you about soon). Another goal is to upgrade the standard of care and education for women with these disorders by giving Katherine, our Board and our volunteers the tools to effectively collaborate with policy makers, researchers and key stakeholders. Katherine can’t do this alone. Our Board can’t do this alone. We need funding and additional volunteers. And to raise money I think we need an event, so I’ve decided to take one out for a spin. I’d like to introduce to you the first annual Climb Out of the Darkness, an annual hiking event to support Postpartum Progress. Every year on June 21st, the longest day of the year — the day with the most light, to symbolize our collective rise out of the darkness and despair of postpartum depression and its nasty cousins of anxiety and psychosis — I’m going to climb a mountain. If you are reading this blog, then you have kicked these illnesses or you are in the grueling process of doing so. You have climbed a metaphorical mountain of the highest heights. Join me in a much easier climb and help us raise money so that Postpartum Progress can continue to be there for women all around the world when they are in the darkness. Help us shine the light of hope with our words and our advocacy efforts for our fellow mothers to be educated and treated quickly. I’m going to climb Mt. Greylock near my home in Western Massachusetts. It has an elevation of 3,488′ and is the highest natural point in Massachusetts. And don’t worry, when I say climb I mean I’ll take a moderate hike on the trails to the top. Katherine and her kids are also going to join in and climb her local Sawnee Mountain, with an elevation of 1,946 feet. She says it’s more like a large hill, but it’s still officially a mountain! 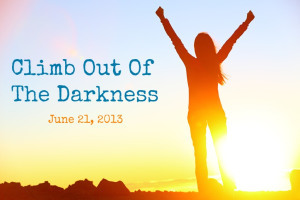 If you’d like to create your own climb for Climb Out of the Darkness, I can help you find a fun hike in your neck of the woods and can also help with suggested fundraising letters and moral support. And if you can’t do it on the 21st, do it on the 22nd. Whenever and wherever you can. You can also check out Trails.com to find local mountain and other hiking trails – from easy to difficult, whatever you’d like. If you don’t have time to play this time around, you can go to the same link above and like it or tweet it or send an old fashioned email to your friends and family and ask them to support us, and by us I mean the millions of readers of this blog past and present, and what I hope is your favorite charity — Postpartum Progress, Inc.
And please know we’re going to do this every year, every beautifully longest day, with the sun shining strong and bright down on us as we celebrate the triumph of so many over these illnesses and hopefully inspire those still climbing up and out. This entry was posted in postpartum depression. Bookmark the permalink.